I received an advanced edition of the LyveHome Photo and Video Manager a week ago, and have been putting it through it's paces for the last few days. It is a local network connected appliance that serves as a backup for all of your pictures and home video files. Rather than your data being in the cloud where it can be hacked, it resides in your home on your local network giving you security and only uses the cloud to authenticate and locate the device to send your pictures to it. When you have the application running on your iOS, Android, Mac, or PC device it uploads any new picture and home video to the internal 2TB HDD. This allows you to access the data files from any other authorized device. The appliance itself is quite slick. The device has a 5 inch touch screen display with an SD card slot on the side and USB port on the rear for data transfer from portable media. It also has an HDMI port and audio out jack for connection to your entertainment center for picture or video playback. 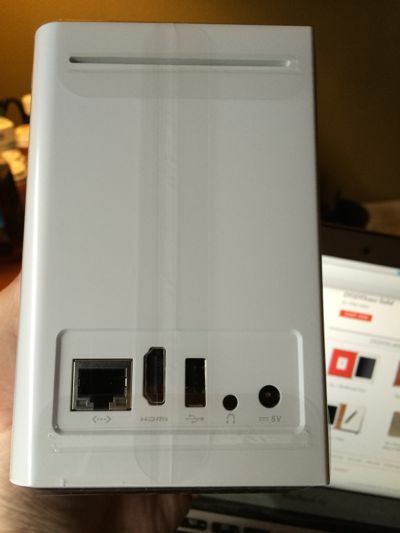 It will connect wirelessly via 802.11 b/g/n, and also has Gigabit ethernet for connection directly to your router if you need it. The LyveHome has very basic software built in, managing it's connection to the network and the LyveHome server for authentication. It also keeps track of the amount of space used my pictures and video on the internal drive. 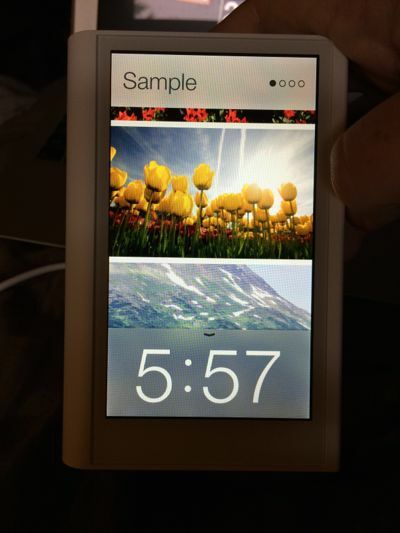 Screen 1 of 4: The default display can show either sample pictures or scroll through your uploaded images.Screen 2 of 4: The status screen displays the amount of space remaining and number of pictures and videos stored on the device.Screen 3 of 4: The device screen shows you all of the devices authorized to transfer to and from the LyveHomeScreen 4 of 4: The final screen is the settings screen, where you control brightness, which images are displayed on the main screen, and your network and other settings. The software for iOS is also very basic. When you first open it you are asked to either create or sign into an existing Lyve account. Once that is accomplished the software asks for permission to access your camera roll. If given access it starts processing your pictures and uploading them to the LyveHome. The settings screen gives you the ability to toggle auto-import, upload over cellular data, and a power upload feature which prevents your device from going to sleep while transferring (transfer stops when the iOS device goes into standby). Top of settings pageBottom of settings pageThe software for the Mac is pretty similar. The software will automatically detect iPhoto and Aperture libraries and copy them, and then allows you to specify other folders to have pictures automatically copied from when the software detects they are added. In all the software makes it easy and the device is great if you have a large quantity of photos and videos to keep a-hold of. The idea of having everything local instead of in the cloud I'm of mixed opinion about. While for my family, with multiple iPhones taking pictures and photos and videos for the web sites on multiple computers and cameras, I don't know that it makes as much sense for most families. Cloud storage is more convenient for most people, and doesn't require connection to a local device. While intended for the home, I really see this as being of more value to home office and small business customers with multiple users and content they need to keep secure. The only value it has to the average family is as a way for everyone to share photos without them being uploaded to the web where photos can be accessed by others.